Tag Archive | "job growth"
Posted on 28 January 2014. Tags: Canada, job growth, manufacturing, Mexico, NAFTA, trade, U.S.
How did you ring in the New Year? Did you raise a toast to the 20th anniversary of North American Free Trade Agreement? 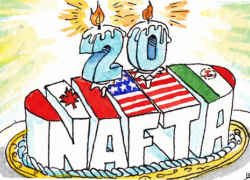 Probably not, but January 1, 2014, marked the 20th year of NAFTA’s existence. NAFTA is one of the largest trading blocs in the world and thus still remains a relevant point of discussion when evaluating United States (U.S.) trade policy. In many ways NAFTA did just what a free-trade agreement is primarily aimed at accomplishing: increase trade. Today, trade between Mexico, the U.S., and Canada has increased by 3.5 times the levels seen in 1994. In 2010, the U.S. had $918 billion in trade with Canada and Mexico. Mexico has become a major automaker. It now produces 3 million vehicles per year, an increase of 50% since 1994. Finally, the U.S.’s and Mexico’s investment in Canada has tripled since 1994. In terms of trade liberalization, NAFTA is a success. Yet, NAFTA still faces criticisms for perpetuating economic and social barriers and inequalities. Some of the identified underlying economic and social goals of the signing parties to NAFTA are as follows: promote equitable wages, job growth, align environmental standards, and increase investment. Although there has been an increase in automotive manufacturing in Mexico, the jobs in the industry are notoriously low paying (about 15% of wages paid in the U.S.). The wage gap between Mexico and the U.S. and Canada exists in other industries as well. However, Mexico has failed to strengthen its labor unions even though the competition (Latin American and Asian countries) has, keeping Mexican wages low and failing to reach the goal of wage equality. Economists still debate whether NAFTA has led to net job growth or net job loss. On one hand, more jobs have been created in Mexico and Canada in the manufacturing sector and more export related jobs have been created in the U.S. On the other hand, manufacturing jobs in the U.S. have been outsourced to countries, such as Mexico, where the wages are lower. In the manufacturing sector, it seems as though NAFTA members must first accomplish the goals of equitable wages before job growth is a possibility. Upon the ratification of NAFTA, NAFTA members negotiated a parallel agreement focusing on environmental concerns: the North American Agreement on Environmental Cooperation (NAACE). The NAACE aims to improve member nations’ understanding of the effects trade has on the environment and to align member nations’ environmental policies. Although the NAACE has set forth an environmental agenda for NAFTA members, measuring its success has been difficult. The body has not yet determined what data would produce high-quality environmental linkages to trade. The connections the NAACE has made show that trade liberalization depletes specific natural resources and leads to increased air and water pollution. The main reason for such impacts is that NAFTA member nations have failed to integrate trade and environmental policies that combat such negative impacts. NAFTA has increased investments in all three signatories. The binding arbitration panels for foreign investors allows “investors to bypass the courts with complaints that government regulation unfairly affects their businesses” and, therefore, are quite favorable to investors. Those complaints brought before the panel deal with resource management or environmental rules. In total, Mexico and Canada have paid about $350 million in damages to foreign investors. What about the U.S. you ask? Well, the U.S. hasn’t paid a penny. These panels overwhelmingly rule in favor of U.S. investors, exasperating yet another inequality where the U.S. ends up on top. These failures cannot be overlooked, but is the correlation to NAFTA really as strong as critics seem to think? NAFTA has done exactly what free trade agreements are supposed to do: increase and liberalize trade. In order to accomplish the underlying goals, governments need to make broader policy changes. First and foremost, member nations need to align their policies in the areas that effect trade, for example, environmental and worker protection. Second, members need to invest in themselves to get up to par with these policies. Third, members need to let go of protectionist measures and let comparative advantage do its work. The U.S. continues to protect markets (namely agriculture) in which it does not have the comparative advantage, disallowing counties (namely Mexico) from holding a larger stake in those markets. Using free trade agreements as motivation to make larger policy changes might work, but free trade agreements themselves will not fix broken policies. Alicia Guber is a 2L and the Alumni Editor on the Denver Journal of International Law and Policy.